David de Rothschild talking about the Oceans and the meaning of Plastiki. The Slow Life Symposium convenes business leaders, scientists, NGOs, renowned thinkers and policy makers to help accelerate progress towards environmental sustainability. Participants discuss global issues and seek practical solutions that can be applied within a local context. 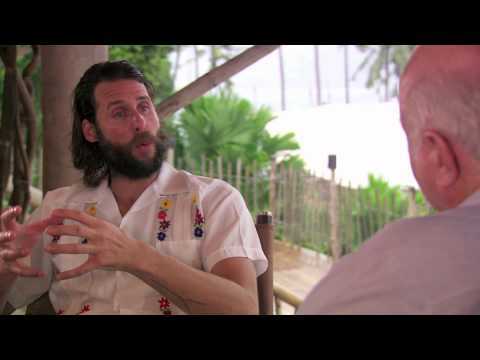 StFF Founder and Chairman, David de Rothschild, is a participant. See pre-event interview here. StFF believes in learning through adventure and that storytelling can inspire people, providing lifelong skills. This company’s work has been brought to our attention, so check out Fafu’s play stuff here. We work really hard on making products that inspire children to find their own stories and ideas rather than following ours. We want the products to have endless possibilities and not have an obvious purpose so that the child will feel a bit puzzled and inspired to create and collaborate with other children. 5000 Mile Project – complete! Katharine and David Lowrie have completed their epic adventure – see The Guardian’s feature here. Tomorrow (Saturday 26th October 2013) the couple will be in London celebrating their achievement. You are welcome to join them: 1430-16.30pm, 80-100 Victoria Street, SW1E 5JL , London. with details of the presentation and run. We would absolutely love to see you. Want to know more about The Green Shack Project from Touching the Earth Lightly? This video is a great place to start. This film has been commissioned by the Natural Resources Defense Council (NRDC) to raise awareness of plastic in our oceans and inspire us all to help reduce the waste. Beautifully done and worth a look. The Great Plastic Purge from leftchannel on Vimeo. Roz Savage visits TED Yale to explain her motivations to row – adventure and the environment. Founded in 2004, UK film distributer, Dogwoof, has released award-winning independent films from around the world. Its main focus is documentaries that, in some way, inspire creativity, thought and change – about communities, individuals, the environment or social issues. Dogwoof has asked us to draw your attention to Village at the End of the World, which is in cinemas now. This is a new film about a remote village in Greenland where thinning ice sheets are interrupting their traditional way of life. Picturehouse operates 21 Picturehouse cinemas and has chosen the film for their Picturehouse Docs Discover Tuesday event for June – so on Tuesday 4th June, the film will screen at every Picturehouse cinema. For more information click here. To help you make sure you catch this remarkable and beautifully shot film by UK Director, Sarah Gavron, Dogwoof is giving away 2 tickets to each screening – email patrick@dogwoof.com to enter the draw. Lloyd Godson – an Australian Geographic Adventurer of the Year – has applied for one of Tourism Australia’s Best Jobs in the World, as the Queensland Park Ranger (https://bestjobs.australia.com/default.aspx?email=p2edm&fb=False). He has been shortlisted from more than 600,000 applications and 45,000 video entries to the final 25. We will let you know if Lloyd is successful.